Motherhood: All consuming, fulfilling, terrifying, joyful, confusion, lost, purposeful, loving, tender, anger, hopeful, enduring, these are just a few feelings and thoughts that spring to my mind when I think of this term. When you become a mother, it becomes increasingly difficult to numb out from life. You have a little person running around in your house causing all kinds of feelings, thoughts, and reactions from you. They are disrupting all of your coping skills that you have used in the past to numb out. It’s really quite inconvenient to say the least. Pretty soon you find yourself a blob on the floor, completely overwhelmed by thoughts and feelings that you have completely forgotten about since childhood. You can’t even remember what they feel like, let alone be completely taken over by them. In a way it’s an opportunity to have compassion on your old tantrum throwing toddler self, which is probably the last time you truly felt out of control of yourself. This is what Brene Brown has to say about numbing in her fabulous book Daring Greatly, “I believe we all numb our feelings. We may not do it compulsively and chronically, which is addiction, but that doesn’t mean that we don’t numb our sense of vulnerability. And numbing vulnerability is especially debilitating because it doesn’t just deaden the pain of our experiences of love, joy , belonging, creativity, and empathy. We can’t selectively numb emotion. Numb the dark and you numb the light.” After becoming self-aware to numbing, the next question you might ask yourself is why do I do it? 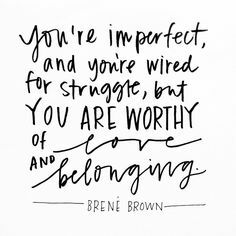 This is what Brene Brown has to say to that, “… the most powerful need for numbing seems to come from combination of all three—shame, anxiety, and disconnection.”(Daring Greatly) When I finally became self-aware to myself numbing out, it greatly pained me, but it also answered a lot of questions for me. I can’t tell you how many times I thought to myself, “why am I not more excited about this …., or why is this ….having no effect on me at all. Why do I feel dead inside?” Our culture has become extremely pain and discomfort avoidant. The result is deadness. If you avoid pain, then you lose the ability to experience love, joy, and all the other positive feel good emotions. Our brains cannot selectively depress emotions. If we seek to depress one emotion, it starts a domino effect on all other emotions. I have learned to not be afraid of pain. The thawing out process is very painful, but so worth it. When I began to let myself sit with the pain, and grieve the things that had transpired to cause it, I experienced a profound sense of relief. When I found myself reaching for old patterns of numbing, I stopped myself, and asked, “what am I feeling in this moment?” We numb to not be present in the moment, because to be present is to risk pain and vulnerability. So we disassociate, worry about the future, or dwell in the past. There is a reason the Lord asks us to not worry about the future, or dwell in the past. The present is where healing is found, and where He is with us. Yes He exists out of time, and He is in the future, and in the past. But He chooses to interact with us in the present. His healing presence is in the present. He asks us to be brave, and trust Him to remain with Him in the present. He wants to help us be present, because He knows that healing only comes from being present. Trust Him to sit with you in the pain, in this present moment. He wants to reinvigorate your mind and emotions with His presence. He wants to show you that all emotions are created by Him, and He has experienced them all Himself. Mindfulness to me is choosing to not let fear or pain stop me from being present. That all emotions have equal value in my life. That all of them are valid for the moment I am to experience them. The Lord empowers me to experience my emotions, and then move past them. When we are trying to suppress our emotions, we exert rigid control over ourselves. When that rigidity becomes overwhelmed, we are overcome with a tidal wave of undealt with emotions in that moment, and it scares us. Then we fall into the shame spiral of regret, for losing our temper with our children, and we go back into hiding and suppressing our emotions all over again. Repeating the vicious cycle over and over. But there is hope in the Lord. There is hope for the healing of your momma soul. You are not alone in this struggle. I share it with you, and many other mothers as well. Give yourself permission to care for yourself. When you feel the pressure building, or mindlessly scrounging around in the pantry looking for carbs, be kind and ask, “what am I feeling in this moment?” Trust the Lord to help you find a way to get your needs met in that moment. Trust Him to help you feel fully alive. I am so proud of you for starting this lovely blog. You are full of Godly wisdom and sound advice. Although I am not a Mother. I can relate to a lot of what’s presented here. Thank you so much. I am excited to see the direction the Lord has for this go.